We have had two people who have used our Topical DHAA Vitamin C serum as a treatment for infected spider bites. The one in the video below was definitely identified as a white tailed spider bite, the spider was found in the trouser leg. The other spider bite (representative pic below) was more ulcerated with a deep hole in the middle surrounded by black edges. 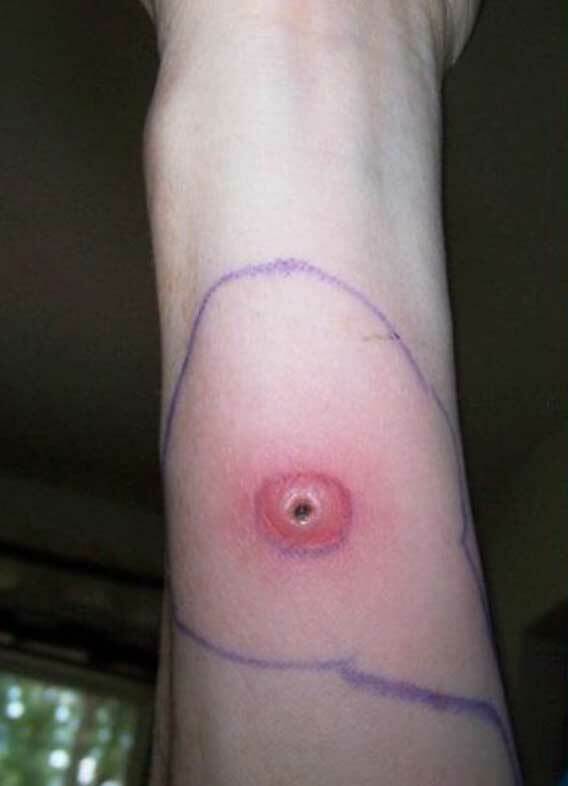 Unfortunately we didn't take a photo of the second spider bite but the victim identified the photo below from the hundreds on the internet as being very close to the site of her bite and severity of infection. The results were similar to the results achieved in the video above. This victim responded within 24 hours swelling and redness had noticeably abated. Uninfected clean scab formed in around five days with full healing in two weeks. A depressed scar remained for around three months but is now almost imperceptible. We strongly believe the work we are doing by publicising case studies demonstrating the efficiency of Vitamin C DHAA serum represents a valuable contribution towards the future treatment of antibiotic resistant and other bacterial and fungal infections and some skin cancers. We believe we are the only people in the world investigating the role of this natural and common molecule in infections and skin cancers. The serum has also shown to be very effective in replenishing thin easily bruised and torn skin in the elderly or when weakened capilliaries are evident. As proper scientific medical research tends to focus only on the creation of patentable and expensive drugs, research on the compounds we are testing will not occur unless there is widespread demand for it. If you want to help raise awareness, or know someone who has any of the conditions we are testing the serum on, please share this website with your social network or with them directly. Please note that I am not a doctor, and I do not give medical advice or advise anyone to take more vitamin C than the recommended daily dose. If you elect to try anything you read on this website make sure you check with your specialist or doctor first as high dose vitamin C can reduce the efficiency of some medications. Also have a blood test to check for G6PD deficiency if you are considering mega doses of vitamin C. This rare condition reduces vitamin C tolerance.